Unique Cut-n-Break method cuts in stages of 2 1/2in. deep with 9in. twin diamond blades, leaving a thin core that is easily broken off with included breaking tool. Cutting can continue until required depth is reached, up to 16in. Ideal for cutting window and door openings to avoid overcutting at corners. Great for cutting egress windows in basements. 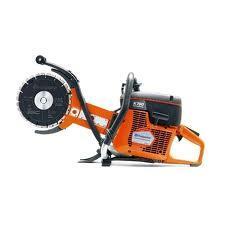 Also works for cutting pipes in trenches, grooves for cabling, expansion joints and crack chasing. Gas engine has Smart Carb to maintain high power and save fuel, Active Air Filtration to extend product life and service intervals, and dust-sealed starter to reduce downtime. Anti-vibration system makes saw more comfortable to use. * Please call us for any questions on our hand held 16 inch cut n break saw mixed gas rentals in Kokomo IN, Logansport, and Central Indiana.